Just sat down for a few minutes to enjoy a little lunch to build up my power for the Walmart trip. This is my first post using my Motorola Droid X and Blogger App. Donna and I had an amazing night with some friends when we went to see one of our youth Robyn Blanton in the production of Shakespeare's "Much Ado About Nothing" in Greenfield Lake's Amphitheatre. It was GREAT and we all felt a little more cultured LOL. This morning I had the opportunity to help the Gaskill's with Sanctuary VBS decorations. I was so appreciative of the help Sam, Fenner and Chris offered. It really looks nice. I then put some final touches on our 5th and 6th grade room and was surprised at the creativity of Luke Ball. I am looking forward to seeing God speak through him. Oh I forgot about the washing machine leak at our house that we had to deal with in the middle of all this. Thankfully God led us to an honest plummer. If u ever need one I have a great reference. If you are still reading this please know I am only reflecting on the goodness of God not my works or lack thereof. 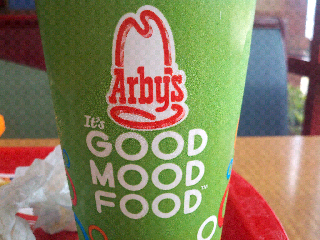 As I sat eating my Arby's sandwich I heard two guys talk about their party lifestyle. I prayed for them because I remember the emptiness in my life during those days. Don't get me wrong. I still party John 10:10 style. Jesus said, "The thief comes only to steal, kill, and destroy but I have come that they may have life to the full." As a believer I experience the full life. The peaks are higher and the valley's lower but thankfully I am not traversing them alone. Are you having a crazy day? Know that everything that is thrown at you is to pull your dependence away from yourself and to Christ. That is the magnetism of the cross.. Jesus keeps us grounded in the crazy. I am so thankful for the opportunity to have have the Bible. I know it sounds like a "preachy" thing to say but I mean it from the bottom of my heart. It often reads "me" rather than me reading "it". Just this morning God has reminded me that frustration occurs when I look to much toward the future rather than living in today. There are many passages in the Bible that speak to the danger of looking too far ahead. I am reminded of when Moses was in the wilderness and God was providing for them each day by sending Manna to eat. God told them to only get the Manna they needed for that day except for the Sabbath. When they tested God and tried to store leftovers for the next day it would spoil Exodus 16:19. Here are some other passages that help me when I become too much of a "forward" thinker. Proverbs 27:1 Don’t brag about tomorrow, since you don’t know what the day will bring. Matthew 6:24-25 24 “No one can serve two masters. For you will hate one and love the other; you will be devoted to one and despise the other. You cannot serve both God and money. 25 “That is why I tell you not to worry about everyday life—whether you have enough food and drink, or enough clothes to wear. Isn’t life more than food, and your body more than clothing? I am reminded of an Adam Sandler movie called "Click". Adam Sandler's character went to a Bed, Bath and Beyond where he met the always creepy Christopher Walken. In the back room of the store where the "beyond" items were displayed, there was a magical remote that could fast forward time but not rewind. In the moment it seemed like a great thing. He could fast forward through fights with his wife, uncomfortable work situations, his dog taking too long to use the bathroom, etc. This was all good until he gets to the end of his life and realizes those things he fast forwarded through were actually the things that made his life so rich. My prayer this morning is that if tomorrow never comes, may I be expectant and hopeful in what I encounter today. Enjoy the "manna" God has given for me today and know that He will give me what I need tomorrow. This is easier said than done, but that's why I am making this a prayer. May I treasure the fact that God in His infinite love and wisdom 'unfolds" my life daily rather than "laying it out' in a big picture. The big picture plan increases my desire to depend on myself rather than daily depending on God. If tomorrow never comes, I am confident that God is working in me today. Thank you for the ways you have blessed me today. You are the one and only True God. Mountains tremble in your presence. Oceans roar at the wave of your hands. You are God and I am not. Forgive me where I have fallen short of your will for my life in my daily choices. Help me to see you in every encounter and give me your insight as I interact with those you place in my path. Thank you for the loved ones and friends you have placed in my life for today. May I cherish them and not take them for granted. May the job you have placed me in bring glory to You and to me the sense of knowing you are pleased. May my heart not grow weary or walk not become faint as I leave my tomorrow to you and be obedient in the today.